Ready When You Are, C.B. dared us all to read from our TBR piles only for a period of our choosing beginning 1/1/11. The deadline for accepting the dare was 12/31/10 at midnight Pacific Time. As usual, I am late to the game but I am going to participate anyway. The most extreme dare was to go from 1/1/11 to 4/1/11 (translation for you across the Atlantic: that end date is April 1st, not January 4th). Since I have about 400 books on my TBR pile. And since I really need to focus my disposable income on house projects, I am taking the dare and plan to only read TBR books until April 1st. 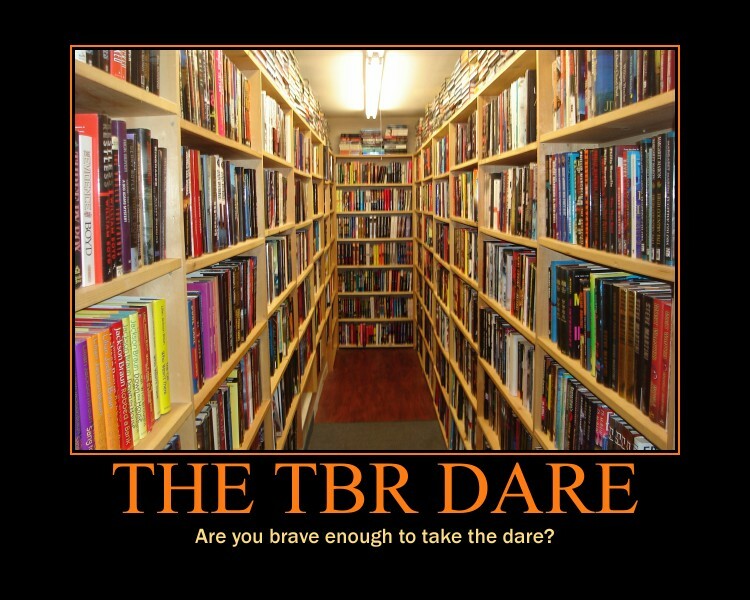 And I know I have already broken the main rule of the dare–to accept it by 12/31–but I haven’t checked out, borrowed, been gifted, or purchased any books since before then. Thankfully I finally got my Persephone Secret Santa gift on 12/30 so I have those books already ensconced in my TBR. But more on the later this week. Off I go to read something from my TBR. Suggested solution (that will also help keep us poor booksellers paid): Start a second TBR pile, just don't tell the first one that your doing it. I'll count you as in. Best of luck making it to April 1. What a good idea! Although I must admit I was rather unimpressed when I first read it, as I'd forgotten you guys had the date differently from us. I would love to do this, but once I've got book group books and uni books done, I doubt I'd be able to read more than one or two other books… well, I probably do just read tbr pile books, apart from those, as it is. Oh good for you, Thomas! I really should take part in this dare, but I enjoy the library and half price books too much to commit to a four month long hiatus. I plan to “try” to read several books from my overstuffed shelves. I look forward to hearing your progress. I've already had to bend my own rules a little, I placed an order at Book Depository last night — I didn't have secure internet access last week while on vacation. So I shall extend my book-buying band until April 2. And I still haven't received my Persephone Secret Santa gift! The mail was on hold for a week because we were out of town and I won't get it until tomorrow. Hopefully they'll be something dove-grey in the mail. Crossing my fingers! Steve: Gave me a giggle. Gotta save my pennies these days. Stu: I already have so many great books of every possible genre so I should have plenty to keep me happy. Simon: You don't think that four days of reading from the TBR is impressive? Molly: It will be intersting how many I can knock out in four months. Karen: Hopefully you will get your Persephone Secret Santa book by April 3rd! This is definitely a challenge I should take on. I have loads of books on the TBR pile. I will definitely commit to making some progress on the stack!